Bed bugs are a lingering threat for anyone who lives in an urban area. Virtually every city in North America has been infested with bed bugs as a result of regulations to pesticides that have allowed them to return with a vengeance. But not every creepy crawly you find in your home, or even bedroom, is a bed bug and there are plenty of bed bug imposters out there. Knowing what they are will help save you time and stress. Bed bugs have very specific life patterns and cycles, but they also have several imposter bugs out there that may raise some flags for you. So you don’t alarm yourself or unnecessarily call your landlord or exterminator, it’s good to do research. Below are some bugs commonly mistaken for bed bugs at first site. Depending on your home’s climate and situation, this may be one of the most common imposters. While their shape is too long to match bed bugs, their reddish/brown color and small size is usually what gets them noticed. They like warmth, moisture, but not human blood. These tiny critters look even more like bed bugs. They’re about the size and shape of fleas, matching closely to the bed bug’s oval shape and they have a deep red/brown color that make them appear as though they’ve just taken a blood meal. But these guys feed on food and scraps, not mammals. These bugs not only look almost identical to bed bug nymphs, but their usual hiding spots make their behavior seem like that of bed bugs. As the name suggests, they’re usually found between the pages of books, a common place for bed bugs to hide during the day. They’ve also been known to hide behind wallpaper and picture frames, other common places for bed bugs. Bed bugs are hitchhikers. They don’t like heat, so they tend to stay away from clothes, skin, or hiding in someone’s hair. But they’re commonly transported on bags and luggage, making public transit a very common place to pick up a future bed bug infestation. And, once started, it’s very hard to get the infestation back under control. You can be bit by bugs that aren’t bed bugs. But bed bug bites are unique. While the small welts might resemble other bites and your level of allergy to bed bug saliva will dictate your level of reaction, the placement of bites is what matters. 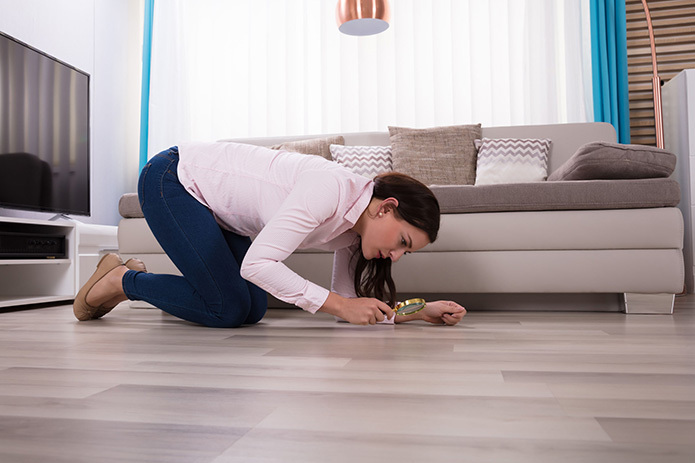 Bites that appear in a line are indicative of bed bugs as a feeding usually takes around 10 minutes and they often become detached and have to reattach as you move in the night. Bed bugs can be a traumatic experience for apartment dwellers and city home owners. But not every bug that likes to hide in crevices and come out at night is a bed bug. It’s worth doing research before you put yourself into a panic as a result of finding lookalikes. Especially since each species requires its own treatment from a pro. Hi-Tech Pest Control specializes in the identification and removal of bed bugs. Since bed bug infestations have become an increasingly large problem here in Southeastern Michigan, early bed bug identification is the key to effectively ridding them for good. Hi-Tech Pest Control has been Southeastern Michigan’s leader residential and commercial bed bug removal for over 30 years, successfully eradicating pests in tens of thousands of homes using a combination of experience, knowledge, and the latest and greatest in bed bug extermination technology and approaches. We are the only Michigan Bed Bug company to offer a 6-month warranty on all bed bug extermination services! Call today for a Free Pest Inspection!